AP Limited Editions was born in the USA on the nineteenth of February, 2006. We proudly celebrate our tenth anniversary with the launch of The Great American Bald Eagle, a splendid tribute to our country and its magnificent national bird. Native to and found only in North America, the Bald Eagle was immortalized in 1782 on the Great Seal of the USA, standing testimony to the resilience and strength of the values laid down by our founding fathers to shape our great nation. Admired for its breathtaking beauty, this magnificent bird clearly establishes its power, standing three feet tall. In stark contrast to its rich brown-black body comprised of seven thousand feathers, its unique white head proudly proclaims the ideals of democracy and freedom while it silently and steadfastly watches over its horizons, its piercing yellow eyes always alert, its strong talons ever agile. AP Limited Editions invites you to celebrate our tenth anniversary as you journey with The Great American Bald Eagle over the ‘Land of the brave and the Home of the free’. This pen has been meticulously authored by Master Maki-e Shi Fujino San. A combination of Taka Maki-e, Hira Maki-e and Togidashi Maki-e techniques feature on the landscape of the pen. The mountains are rendered in Taka Maki-e, the Cedar trees embellished in Togidashi and the background is beautifully created with Hirame flakes in gold and blue powder. 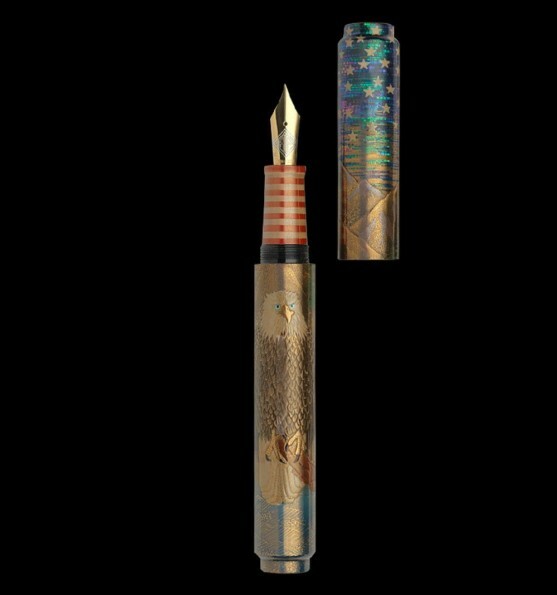 The waves at the bottom of the pen are depicted through Togidashi Maki-e. The Great American Bald Eagle is also crafted through a variety of Maki-e methods with Taka Maki-e used to highlight the face and feet. The feather outlines are defined in Kaki-wari and the feathers in Tsukegaki Maki-e. The brilliant sky is painstakingly crafted with finely sliced abalone shell pieces (0.8 mm) attached one piece at a time dotted with 50 shimmering stars, crafted in Platinum powder and white Urushi. The cap opens to reveal thirteen Red and White stripes superbly crafted on the nib section in brilliant shades of Red and White Urushi. This marvel in Maki-e was seven months in the making.